Journeys and Maps is a set of four double-sided, large-format maps covering the greater part of known Middle-earth: Eriador, Wilderland, Rohan, Gondor and Mordor. With four Adventurer's Maps backed with four hexed Loremaster's Maps, these provide an invaluable play aid for planning your One Ring journeys. 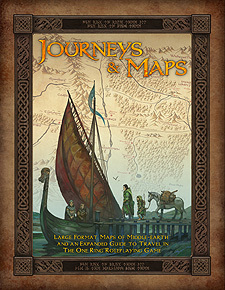 Also included is a 32-page supplement, with rules for water travel by sea and river; an index to all locations covered inThe One Ring Roleplaying Game suppplements to date; a system for detailing ruins found along the roadl; a useful collection of terrain-specific hazards and a section detailing natural wonders, lodgings, and fellow travellers your company might find along the way. makes the perfect addition to your One Ring collection, and is a must-have for your One Ring games.